‘The Seven Sisters’ series is loosely based on the ancient stories and myths surrounding the Seven Sisters of the famous Pleiades star cluster. While it’s not necessary to have any knowledge of the stars or the myths to enjoy the books, there are plenty of hidden references to them if you’re interested and you know where to look. Many of the characters in the books are linked to the Seven Sisters story as told in Greek mythology, via their names, their physical attributes, their roles in the plot and their personalities. Soon after I’d had the inspiration to write a series of books based on the Seven Sisters star cluster, I sat down one night with my family. I already knew that my sisters – all of them 21st century women – would be named after the mythological sisters of old, but there were some issues with the unfamiliar spellings and pronunciations for a modern-day audience. I also knew that I wanted certain other characters from the myths to feature. So that evening, I put up a board with all the main players on it, and a summary of their key attributes. I put some paper and pens on the table, and asked everyone to come up with anagrams and nicknames that could subsequently be used for the characters in the books. Pa Salt – my youngest daughter, Leonora, started the ball rolling with the inspired nickname of Pa Salt, my sisters’ adoptive father, who is roughly modelled on Atlas, the Titan in Greek mythology who held up the world and sky on his shoulders. The anagram takes the ‘P’ from Pleione, the sisters’ mother, and then uses the rest of the letters from Atlas. I particularly love the name because the ‘Salt’ part evokes this character’s love of the sea. Maia – the present-day heroine of the first book was easy, because it’s such a beautiful name and still used in the modern era, so she didn’t need a nickname. Alcyone – ‘Ally’ seemed like a very natural shortening for my second sister. Asterope – this name means ‘Star’, which leapt out as a gorgeous nickname for this character. Celaeno – after playing around with various anagrams that weren’t working, someone suggested the simple nickname of ‘Ce-Ce’, which immediately got the nod of approval from everyone else. Taygete – as this sister was turned into a doe by Artemis in the myth, and in my books was to have a passionate love of animals, we felt that she should be given an animal nickname – we settled on ‘Tiggy’ after the hedgehog Mrs Tiggy-winkle from the Beatrix Potter book. Electra – I knew that this character was going to be fiery and crackling with energy, so this name was perfect as it was. D’Apliése – I really wanted to include the Pleiades somewhere, so we came up with the anagram D’Apliése for the sisters’ surname. Kreeg Eszu – I knew the character of Zeus was going to feature a handful of times in the series. The myths suggest that he fathered children with three of the sisters. 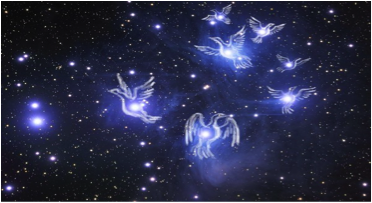 He was also responsible for turning them into doves and placing them in the sky as stars to help them escape the amorous pursuit of the hunter Orion. Zeus was also the god who commanded Atlas to hold up the earth and sky on his shoulders. Because it suited my plot, I split the character into two; the billionaire tycoon Kreeg Eszu and his son, Zed Eszu – Kreeg being an anagram of ‘Greek’ and the surname Eszu being an anagram of ‘Zeus’. Maia becomes involved with the disreputable Zed Eszu whilst studying at university. Atlantis – the fabled lost underwater city, was famed for its beauty, and it was the only name I considered for the hidden sanctuary that was to be Pa Salt and the sisters’ home on the shores of Lake Geneva. Pa Salt’s boat, the Titan – Atlas himself was from the mythological race of seven deities, known as the Titans. Kreeg Eszu’s boat, the Olympus – the name of the yacht was taken from Mount Olympus in Greece, which was the mythical home of the principal Greek gods. Zeus was the king of the gods and the ruler of Mount Olympus. The Greek god of the sea, Poseidon, is another who is purported to have sired children with one or more of the Seven Sisters. Unfortunately, there’s a long-standing association with a certain disaster movie involving a ship of the same name! So I decided I couldn’t include it in the story, using instead the equivalent Roman god, Neptune. The Pavilion – in the Seven Sisters myths, Maia is often described as isolated and living alone in a cave. So I created The Pavilion, a small house in the grounds of Atlantis where my Maia could pursue her solitary career as a translator, before being drawn out into the wider world by the clues that Pa Salt leaves her. Doves – there are several references in the books to the sisters coming and going from Atlantis like flocks of doves leaving and returning to their nest. This not only provides a great metaphor, it also echoes the Seven Sisters myths where the girls were turned into doves by Zeus before being placed in the heavens for all eternity.